Now you are ready to serve the model. Serving the model means that there will be a running TCP/HTTP server which accepts incoming requests with data in the appropriate format, runs inference with this data and give the output as the response. To serve the model, click the Serve button near appropriate version. You will see the serving configuration form which basically specifies execution command, environment, data and resources for the serving object. Let's see all the parameters in details. Workspace - name of workspace, where serving will be run. Cluster - choose cluster where serving will be run physically. Name - specify a name for the serving. Execution command - Bash execution command. Supports any bash-like constructions. Note: For the kibernetika-serving tool description and details, see here. CPU - Docker Image used when not using GPU. 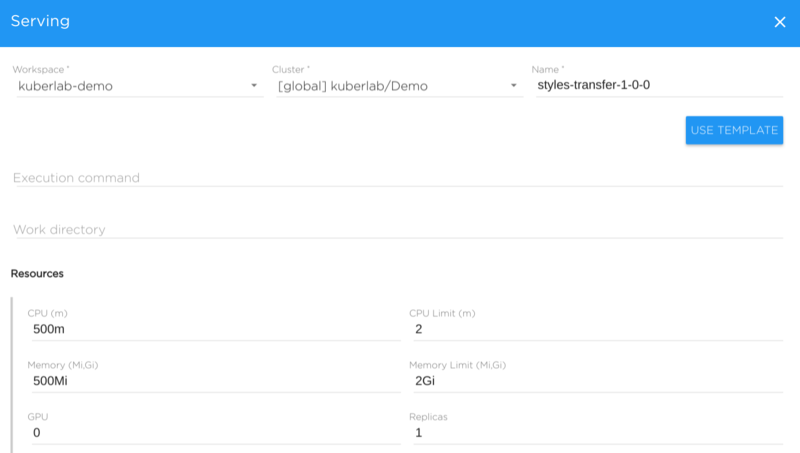 Note: For kibernetika-serving, image kuberlab/serving:latest is usually used, see kibernetika-serving document for the details. Serving parameters only needed for the correct filling and passing parameters values from the Web UI: that is, you can pass number or string to your serving, or even upload a file (say, a picture). Output filter - only specified parameter names will be returned to the UI, e.g. output - will return only output key-value in JSON. 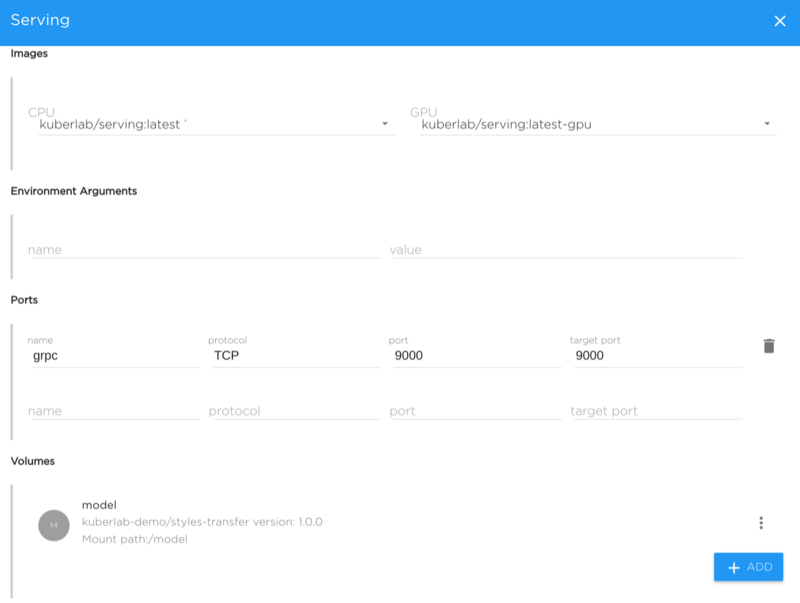 Model - UI will pass the given model name to the serving (important to tensorflow_model_server-based servings). 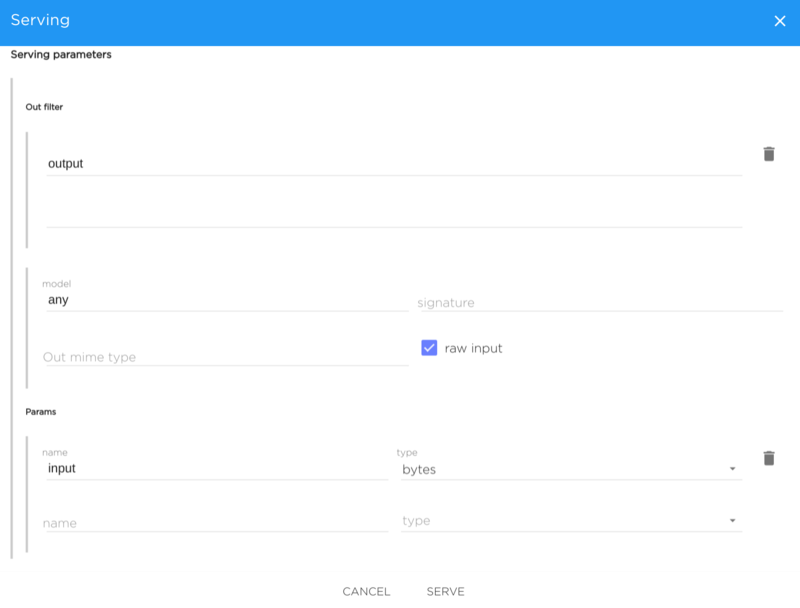 Signature - UI will pass the given model graph signature to the serving (applied only tensorflow_model_server-based servings). Output MIME Type - is specified, the UI will treat the output as this MIME type. Raw input - If marked, inputs sent in data key inputs instead of older features. byte - if this specified, the form for file uploading is shown in the UI. Data is passed to the serving as byte array. bytes - if this specified, the form for file uploading is shown in the UI. Data is passed to the serving as an array of byte arrays containing 1 element. On the started serving, you can pass multiple numbers (for numeric types) separating them by commas.